This is a Combo pack containing both the Adjustable & Stretchwise Headgear for the Pilairo and Pilairo Q nasal pillow mask by Fisher & Paykel. Now you have two options! Pilairo's StretchWise Headgear Strap offers a stable, minimalist design with an unobtrusive, low profile fit. It is made from soft, latex-free elasticized thread with intelligent-stretch properties. The headgear automatically customizes to the wearer; no manual adjustments are necessary and it won't leave marks and indentations on the face. 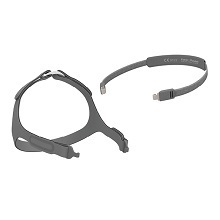 The Adjustable Headgear is more traditional and enables the patient to adjust the size to their preference. Some patients prefer the stability of this headgear. Product code 400HC322 & 400HC328 Pilairo's StretchWise headgear offers a stable, minimalist design with an unobtrusive, low profile fit. It is made from soft, latex-free elasticized thread with intelligent-stretch properties. Very comfortable. I just wish you could only by the back strap separately. Recieved on time. Product that exceed my expectations. Very pleased in every way. THANKS YOU!